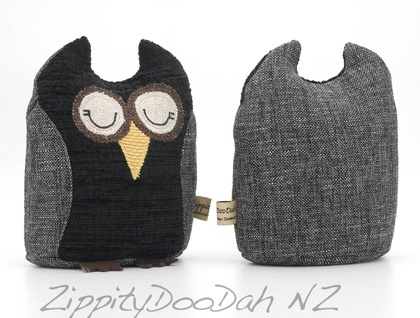 Pandy the owl doorstop is made from Upholstery grade fabric in a wonderful crosshatch charcoal grey. His front is made from complementary black fabric.He has an appliqued beak and felt feet,and sleepy embroidered eyes. Pandy would look great on most carpets or wooden floors, He is the sort of guy that compliments most decors, but has a fondness for rural living. Pandy has a down to earth personality and enjoys the odd sheep joke. Whooo loves Pandy?